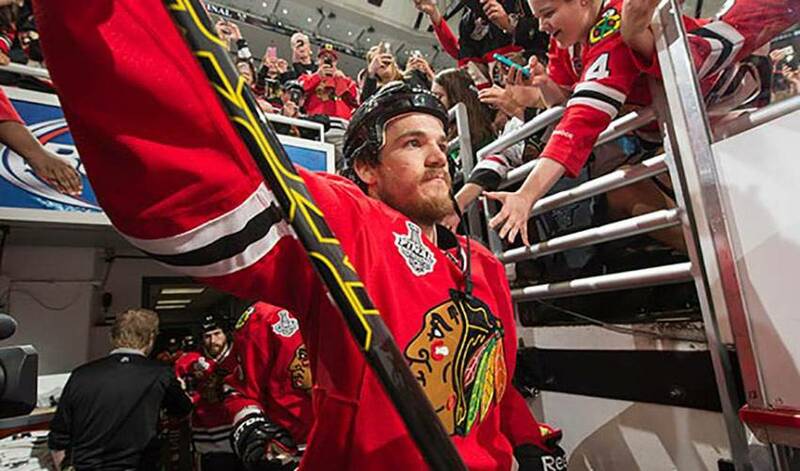 How does Andrew Shaw get his kicks before the NHL season gets underway? Last Sunday, it was at Chicago’s Soldier Field from about 27 yards out, straight through the uprights, complete with a flying shoe. In recognition of the Blackhawks 2016 Stanley Cup triumph, Shaw, along with some of his teammates, took in the NFL game featuring the hometown Chicago Bears and Oakland Raiders. As part of the festivities (they had the Cup in tow), Shaw, in a No. 65 football jersey, was given the opportunity to kick a field goal prior to the start of the game. He didn’t disappoint when it came to his moment in the spotlight. With plenty of cameras focused on his moment of gridiron glory, Shaw stepped up and aced the kick. The real kicker, so to speak, was a flying shoe that sailed through the air the same time as the football. His plan worked to perfection. And, despite the airborne footwear, Shaw didn’t get any ribbing from his fellow players. Could it have served as inspiration for the Bears and their kicker Robbie Gould, who won their first game of the NFL season, courtesy of a 22-20 win via a late field goal? Joking aside, Shaw is only too happy to lend his time (or leg) to the community he plays in. Shaw’s most cherished moments are the ones where the people he meets are a little lost for words. A picture-perfect 27-yard field goal in front of thousands of NFL fans isn’t too shabby either.